With his unforgettable laugh, and his kindly nature, The good natured Goofy has been a favorite of audiences since 1932. No detail of Goofy's persona has been overlooked in this special sculpture made to commemorate his sixtieth birthday in 1992. Goofy's delightful presence will lend a bit of laughter to your life. 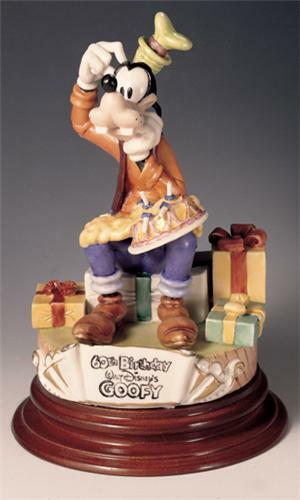 Disney Capodimonte Goofy 60th Birthday from the house of Laurenz in Italy. This truly a work of art. This exquisite porcelain Capodimonte sculpture is from the Disney Laurenz Classic Collection. limited edition of: 210 pieces total made world wide.This is the Rolls Royce of Porcelains. This was created by Enzo Arzenton. He is an Italian sculptor who suddenly took ill and closed his shop in Italy. He did all the molds, fired all the pieces, and hand painted all the pieces to his perfection. This is truly a work of art.